In 1966, the Red Sox had a disastrous season losing 90 games and finished next to last in the American League. Attendance had fallen drastically. The outlook for the team was bleak. In the winter of 1966-67, the Red Sox assembled a group of local businessmen and formed the BoSox Club of Boston, hoping to give a "boost" and to increase ticket sales throughout Boston and New England. 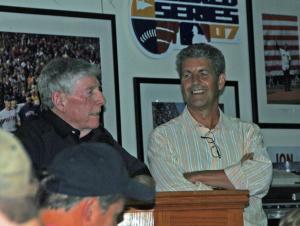 The BoSox Club was first organized by Bill Crowley, the Director of Public Relations for the Red Sox, along with broadcaster Ken Coleman, former Red Sox Dom DiMaggio and Ted Lepcio, and Tom Feenan Sr., Harry Carlson, Bob Cheyne, Brad Jernegan and a few others.In 1967, the first year, the club signed on 305 enthusiastic members from all around New England. Officers were elected including Dom DiMaggio, President; Bradford C. Jernegan, Vice President; Larry Polans, Vice President; and Truman Casner, Legal Advisor. Directors of the club included Bernard Baldwin, Dean M. Boylan, Thomas J. Feenan, Robert Cheyne, Clarence March and James Kelso. We all know what happened during the 1967 season. The Impossible Dream team took the region by storm winning 90 games and the American League pennant. The BoSox Club doesn't take credit for this incredible season, but we do think it is a curious coincidence! Since those early days, the BoSox Club has continued to carry out its mission and grow in membership. Today we are recognized by the Red Sox as the Official Booster Club of the Team and we contribute to a variety of charitable causes through many events and special programs. Mostly though, the BoSox Club continues to provide the most intimate "behind the ropes" experience for our members through our monthly luncheons, spring training trips, BBQs and more.